Sunday, 22 May, one of those glorious winter days in Cape Town: all light and revelation. It wasn’t even 9 am, but the queue in front of the Gardens Community Centre in Hatfield Street looked overwhelming. “Do you by any chance have a spare ticket for sale?” a woman near the entrance asked as we approached. I shook my head in confusion, and her pleading eyes moved on to the next person. My companions, the writers Helen Moffett and Diane Awerbuck, looked just as surprised as I felt. This was no rock concert, nor a sports event. We were here for the inaugural Jewish Literary Festival. We’d heard that the tickets had sold out about a week in advance, but people desperate to get into a literary festival seemed quite unusual. We were spotted by one of the friendly volunteers assisting festival participants and visitors (the lucky ones with tickets) and ushered through the security and registering desks. The crowds inside buzzed with excitement. “Are they giving away something for free?” I wondered aloud. The idea for the festival was born in July last year. In February the organisers – Joanne Jowell, Cindy Moritz, Viv Anstey and Gary Anstey – asked Beryl Eichenberger and Caryn Gootkin to help with the marketing. Together they reached out to a team of volunteers, secured the venue and the sponsors, and began composing a programme which would “appeal to all ages and cover a range of genres” with the aim “to promote constructive dialogue and discussion in the true spirit of Jewish life without promoting any single political or religious agenda”. From food, sports, politics, academia and journalism to fiction, poetry or memoir, the topics on offer were geared to satisfying nearly all tastes. Seven venues, 49 different events, and a palpable atmosphere of being part of something special made for a wonderful mix. There was a programme for children, but I attended only events for adults. However, I often spotted young people in the audiences, which is always heartening. The festival opened for me with “Faribels and foibles in fiction”. Next to me in the Nelson Mandela Auditorium sat a woman crocheting, while Rachel Zadok, Rahla Xenopoulos, Marilyn Cohen de Villiers and Liesl Jobson spoke to Helen Moffett about the faribels and foibles which drive their writing. What could easily have turned out to be a light-hearted conversation quickly became a serious discussion, as an appreciative audience member commented afterwards. This entry was posted in Events and tagged Albie Sachs, Anne Landsman, Cape Town, Diane Awerbuck, Gem Squash Tokoloshe, Helen Moffett, inaugural, Jewish Literary Festival, Jonathan Kaplan, Karina M. Szczurek, Letters of Stone, Liesl Jobson, Lyndall Gordon, Marianne Thamm, Marilyn Cohen de Villiers, Maureen Isaacson, Meg Vandermerwe, Nadine Gordimer, Nechama Brodie, Rachel Zadok, Rahla Xenopoulos, Richard Zimler, Ruth Carneson, Steven Robins, Sunday Independent, Table Mountain, The Children's Hours, Touch on May 30, 2016 by Karina. “…here was an opportunity for writers to test their word against, arguably, the most remarkable moment in their history.” André Brink in “To the Reader”, p. 8. “Later, sun low, tide running out in me, I bus into the township shack of my dear love, my need of her never so strong. She reads me, smiles, her eyes soft in the room’s dusk, her hands beckoning me to come. Later still, I help her to the bed. We are careful with each other as though we hold a fine glass, and my heart sings. Yes, against all odds, my heart sings.” Tatamkulu Afrika in “Against All Odds, My Heart Sings”, p. 13. “Mens se hart is bly: niemand gaan hierdie stukkies toekoms wat die mense vashou weer kan wegneem nie. Byna wil ek sê: hierdie land se politici verdien wragtig nie so ‘n wonderlike bevolking nie.” Breyten Breytenbach in “Joernaal van ‘n wending”, p. 25. “The day has been captured for me by the men and women who couldn’t read or write, but underwrote it, at last, with their kind of signature. May it be the seal on the end of illiteracy, of the pain of imposed ignorance, of the deprivation of the fullness of life.” Nadine Gordimer in “April 27: The First Time”, p. 52. “We all know that it won’t be a smooth road ahead.” Jenny Hobbs in “The Day We Minded Our Peace in Queues”, p. 60. “An Organisation must be disciplined, purposeful, and idealistic in a good sense. It must also be diverse, in that it must encompass others, beyond its own affiliates. It must be committed and dedicated to one goal and one goal only: to change the miserable conditions of people to enable them to live full and rich lives; it must inspire them to realise their full intellectual potential.” Mazisi Kunene, p. 73. 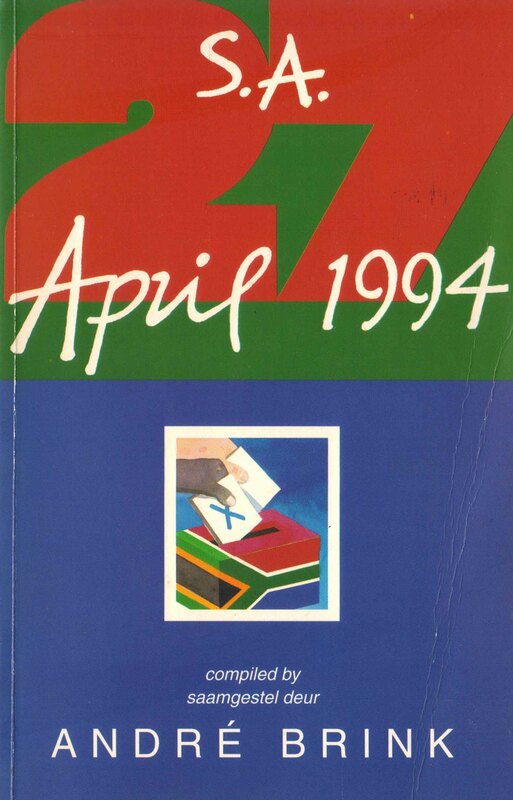 “My greatest victory and achievement as an individual is to know that my children and grandchildren and their age groups in my community move with grace and dignity as full-fledged citizens of South Africa, and with full rights to determine the future of our country.” Ellen Kuzwayo in “The First Democratic Elections in South Africa”, p. 80. “Peace is like an undying light / Shining and glowing from within / Within each one of us” Gcina Mhlophe in “Peace Is Within”, p. 85. “Perhaps it [Table Mountain] was reaffirming its old lesson on faith: on election day. That the future is there for us: we need to have faith in it, and in ourselves. And so I ended my day unemotionally, but deeply affirmed.” Njabulo S Ndebele in “Elections, Mountains, and One Voter”, p. 95. “I picked up the pencil that was well chewed and attached to the makeshift desk by a length of string and put my cross, quickly, trying not to agonise about it yet again.” Mike Nicol in “Voting at the Camel Rock Café”, p. 98. “Wanner iemand my vra wat dink ek van ons toekoms, dan antwoord ek ons mag die toekoms nie ken nie: so bly elke dag ‘n avontuur.” Jan Rabie, p. 108. “So, Mammie en Derri, cheers! Ek leef – kyk, ek leef – in ‘n nuwe Suid-Afrika!” Adam Small in “Feniks: ‘n brief, kamma, aan my ouers (wat al dood is)”, p. 123. “It was after three hours walking, at 7 am, that I cast my two votes at the Dwarsrivier polling station. It was quite clear that I was the very first person to vote there. No doubt the IEC staff manning the station had been expecting something extraordinary all along, but not for the first voter suddenly to appear, as I had done, out of the mountains behind the school-hall that served as the polling station.” Stephen Watson in “Voting With My Feet”, p. 162. “Want vir die heel eerste keer in my lewe was ek ‘n vry Suid-Afrikaan.” Melvin Whitebooi in “Au revoir”, p. 171. This entry was posted in Excerpt, Memories and tagged Abraham H de Vries, Abraham Phillips, Achmat Dangor, Adam Small, Albie Sachs, Alexander Strachan, André Brink, Antjie Krog, Arthur Goldstuck, authors' diary, Berta Smit, Breyten Breytenbach, Chris Barnard, Dalene Matthee, Daniel Hugo, diary, Ellen Kuzwayo, Elsa Joubert, Gcina Mhlophe, George Weideman, Gus Silber, Hennie Aucamp, Ingrid Winterbach, Jan Rabie, Jeanne Goosen, Jenny Hobbs, Kerneels Breytenbach, Klaas Steytler, Lettie Viljoen, Madeleine van Biljon, Marguerite Poland, Marita van der Vyver, Marlene van Niekerk, Mazisi Kunene, Melvin Whitebooi, Mike Nicol, Mzwakhe Mbuli, Nadine Gordimer, Njabulo S Ndebele, Peter Horn, Peter Snyders, Petra Müller, Pieter Dirk-Uys, Queillerie, Rachelle Greeff, Riana Scheepers, SA 27 April 1994, Stephen Watson, Tatamkulu Afrika, Welma Odendaal on April 27, 2014 by Karina. Conference: Writing the ‘Rainbow Nation’? Early next month, I’ll be attending an international conference “examining 20 years of post-apartheid literature” in Regensburg, Germany, where I’ll be giving a paper on cityscapes in recent South African writing. Other participants include Crystal Warren of the amazing National English Literary Museum in Grahamstown and Willie Burger of the University of Pretoria with whom I edited Contrary: Critical Responses to the Novels of André Brink. 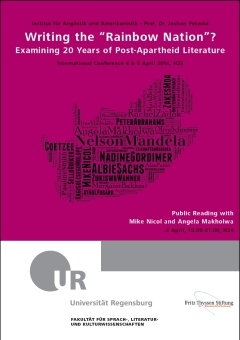 As part of the conference there will be a panel conversation and a reading featuring Mike Nicol and Angela Makholwa. Click here for the Provisional Programme. This entry was posted in Events and tagged Albie Sachs, Angela Makholwa, cityscapes, conference, Contrary, Contrary: Critical Responses to the Novels of André Brink, Crystal Warren, Karina M. Szczurek, Karina Szczurek, Mike Nicol, National English Literature Museum, NELM, paper, post-apartheid literature, rainbow nation, reading, Regensburg, Willie Burger on March 18, 2014 by Karina.